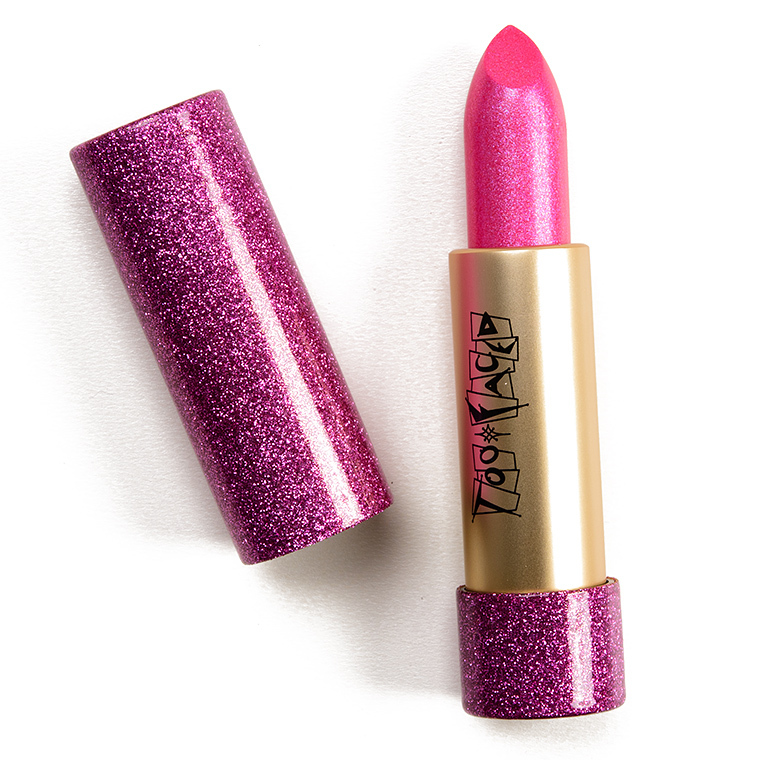 Too Faced Marcia Marcia Marcia Throw Back Lipstick ($22.00 for 0.10 oz.) 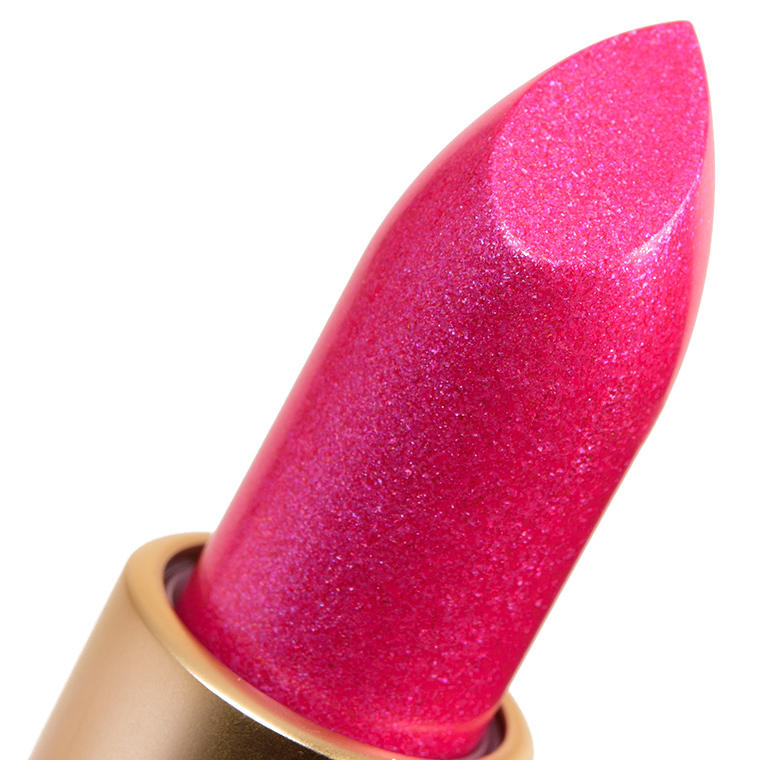 is a vibrant, medium fuchsia pink with cool, bluish undertones and iridescent sparkle and shimmer. It seemed like a mix of pink, teal, and fuchsia sparkly bits that caught the light and reflected it back with a high-shine finish and lots of sparkle. It had semi-opaque pigmentation that applied evenly and didn’t emphasize my lip lines. The consistency was smooth, creamy without being heavy and had moderate slip, which made it comfortable to wear, though it didn’t seem too slippery (but definitely didn’t grip as much as the average lipstick). It wore well for five hours and left a faint stain behind and was hydrating over time. 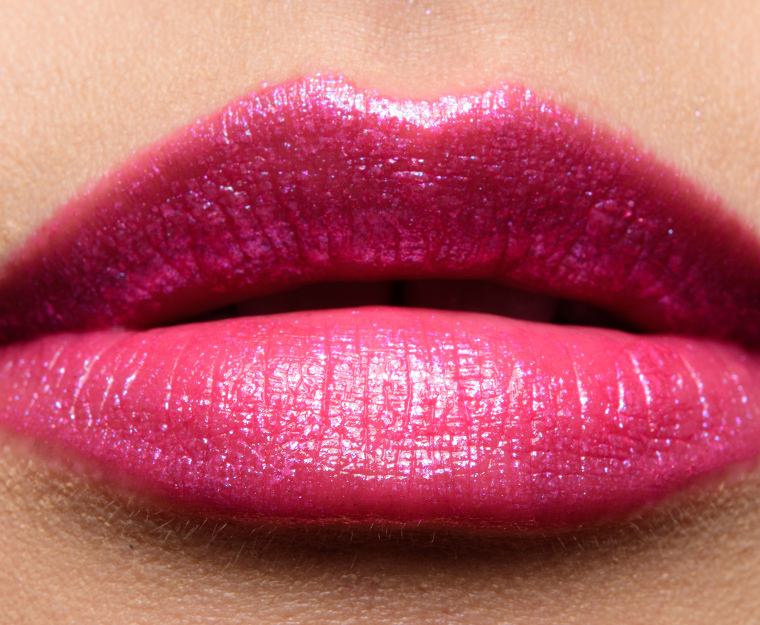 MAC Pink, You Think? (P, $18.50) is less shimmery (90% similar). 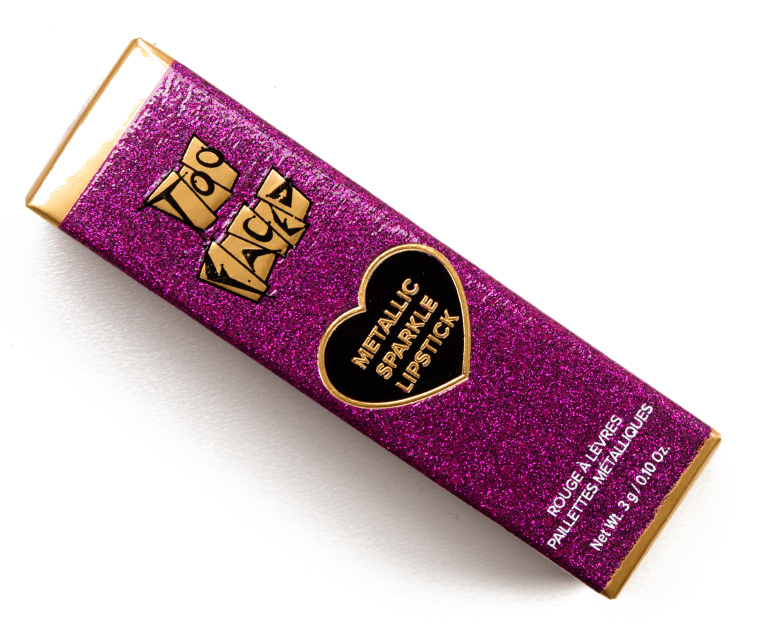 Too Faced Mean Girls (P, $22.00) is lighter (90% similar). Urban Decay Big Bang (P, $18.00) is more muted (85% similar). Tom Ford Beauty Rocco (DC, $36.00) is less shimmery (85% similar). 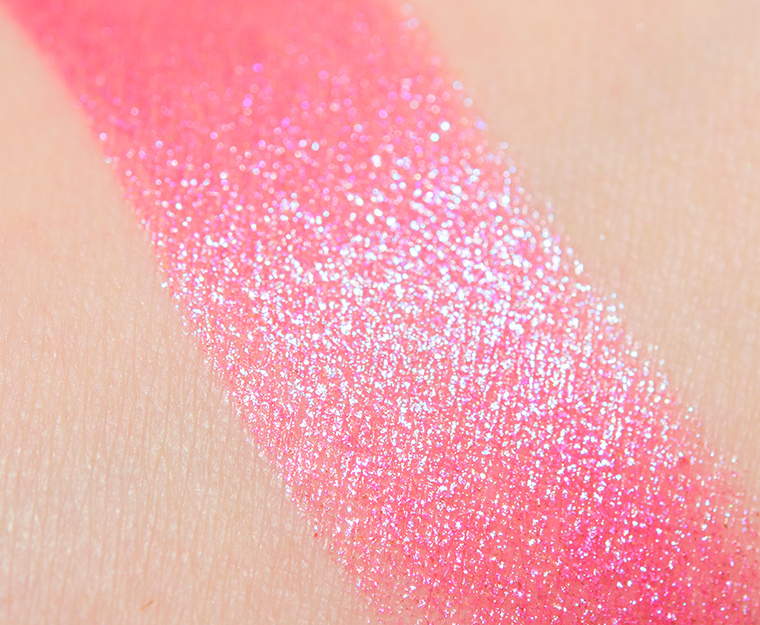 Tom Ford Beauty Flash of Pink (John) (P, $54.00) is less shimmery, more pigmented (85% similar). 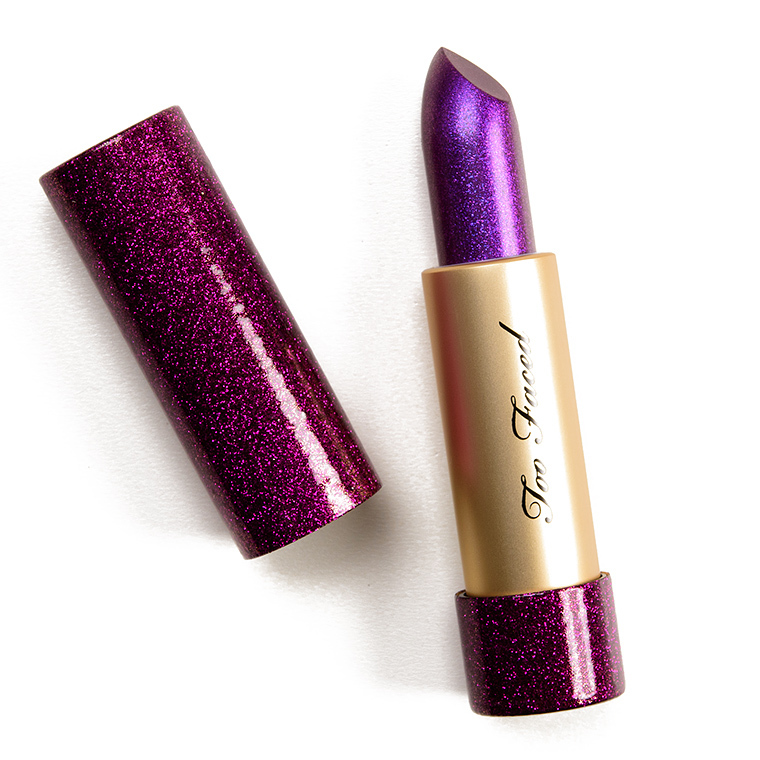 Tom Ford Beauty John (LE, $36.00) is less shimmery, warmer (85% similar). 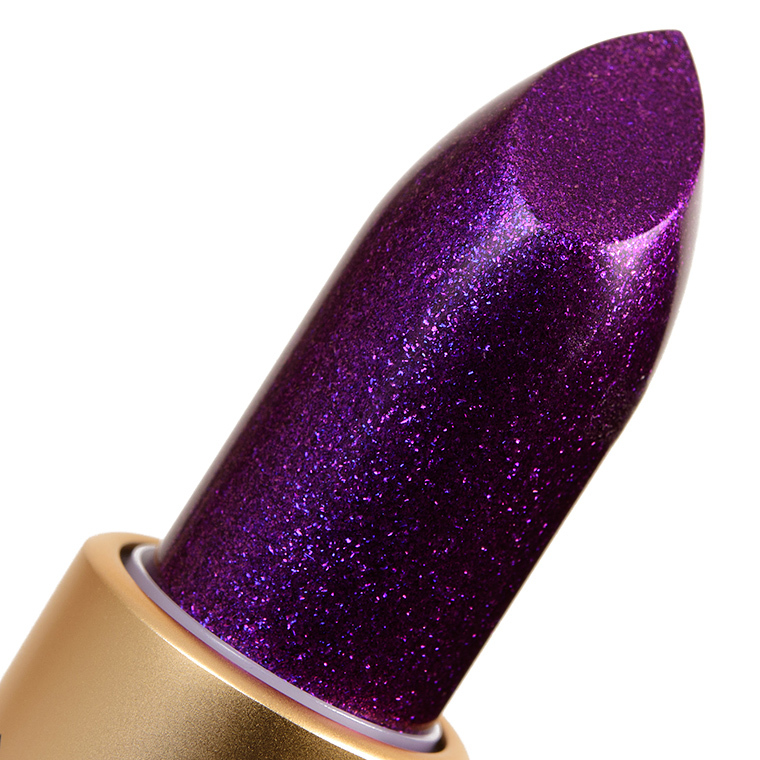 The formula is supposed to have “creamy, comfortable wear” with “full-coverage” pigmentation and a “multi-reflective glitter finish for high-pigment sparkle payoff.” If you aren’t a fan of glitter, just skip to the next lipstick formula, because this is for glitter lovers. Most of the shades had semi-opaque to opaque coverage with a few that had sheerer coverage. For as glitter-packed as they were, they felt creamy and smooth being applied and had minimal grittiness even as they wore away. They had average wear–around four hours–with some of the shades that were prone to staining lingering for closer to six hours. The formula was hydrating and easy to wear–these were the very definition of fun and so on-brand for Too Faced. They finally found a way to inject glitter in all of the ways and actually have it work pretty well. Browse all of our Too Faced Throw Back Lipstick swatches. Polybutene, Caprylic/Capric Triglyceride, Calcium Sodium Borosilicate, Polyethylene, Aluminum Calcium Sodium Silicate, Calcium Aluminum Borosilicate, Microcrystalline Wax/Cera Microcristallina, Silica, Dipentaerythrityl Hexahydroxystearate, Octyldodecanol, Disteardimonium Hectorite, Tin Oxide, Fragrance, Alcohol, Benzyl Alcohol, Pentaerythrityl Tetra-Di-T-Butyl Hydroxyhydrocinnamate, Water, Dicalcium Phosphate, Mica, Synthetic Fluorphlogopite, Carmine (Ci 75470), Titanium Dioxide (Ci 77891), Red 28 Lake (Ci 45410), Iron Oxides (Ci 77491), Red 6 (Ci 15850), Red 7 Lake (Ci 15850), Yellow 5 Lake (Ci 19140), Blue 1 Lake (Ci 42090). Too Faced Pixie Stick Throw Back Lipstick ($22.00 for 0.10 oz.) 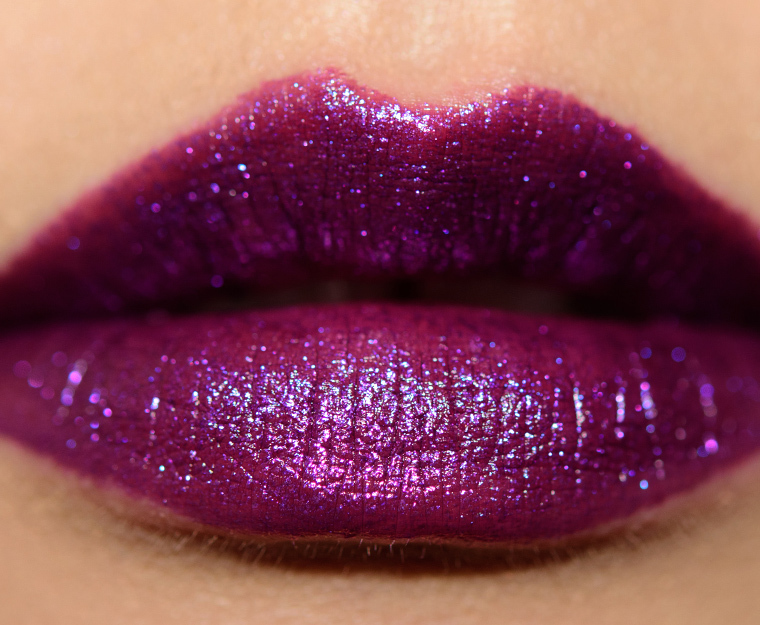 is a rich purple with warm, pink undertones and purple, violet, and bluish sparkle and glitter. It had semi-opaque pigmentation that applied fairly evenly, but there was a bit of product that sunk into my lip lines. I did not find it noticeable in person due to the shinier finish and how much the sparkles/glitters caught the light. 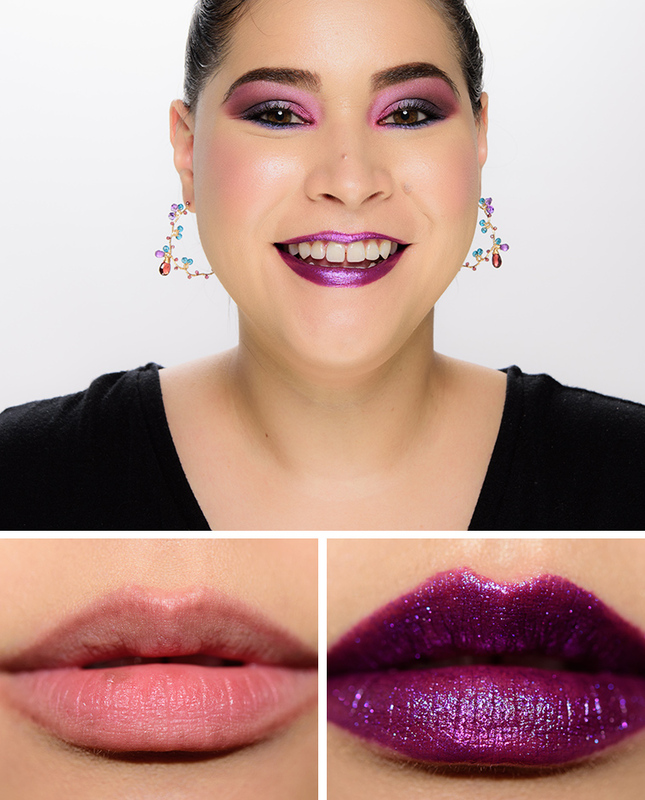 It had a smooth, lightweight consistency with moderate slip, which helped it spread easily across my lips and feel comfortable to wear. This shade stayed on well for five hours, left a soft pinkish stain behind, and was moisturizing while worn. MAC Royal Hour (LE, $18.50) is less shimmery (90% similar). 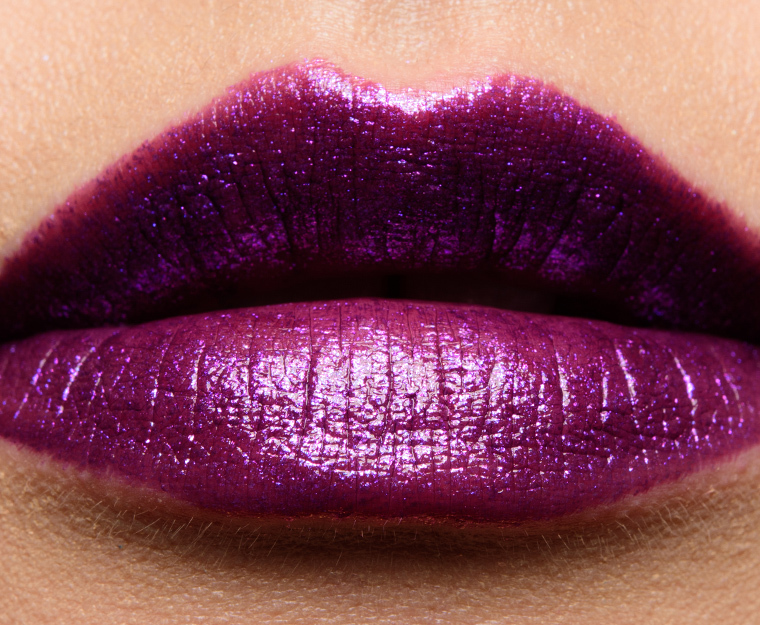 Urban Decay Mad (P, $18.00) is less shimmery, lighter, less glossy (85% similar). Urban Decay Plague (P, $18.00) is warmer (85% similar). 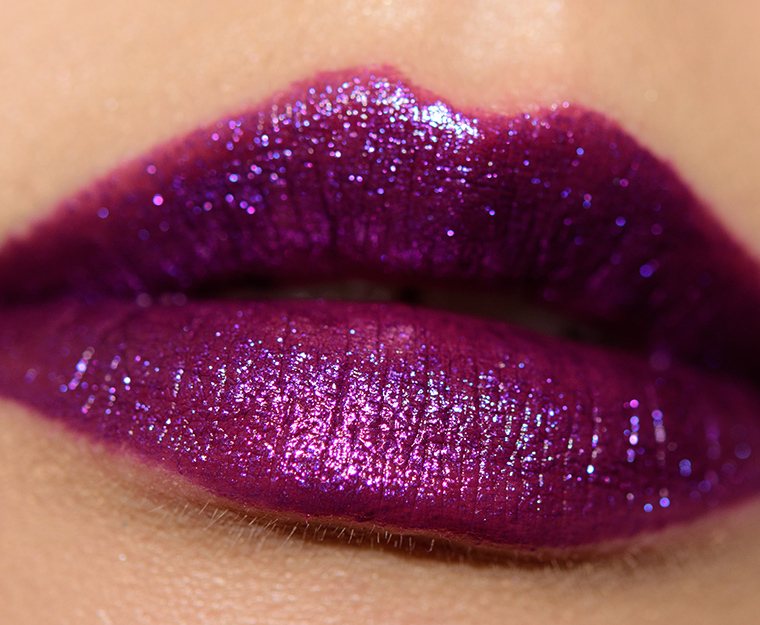 Urban Decay Mad (P, $18.00) is less shimmery, less glossy (85% similar). 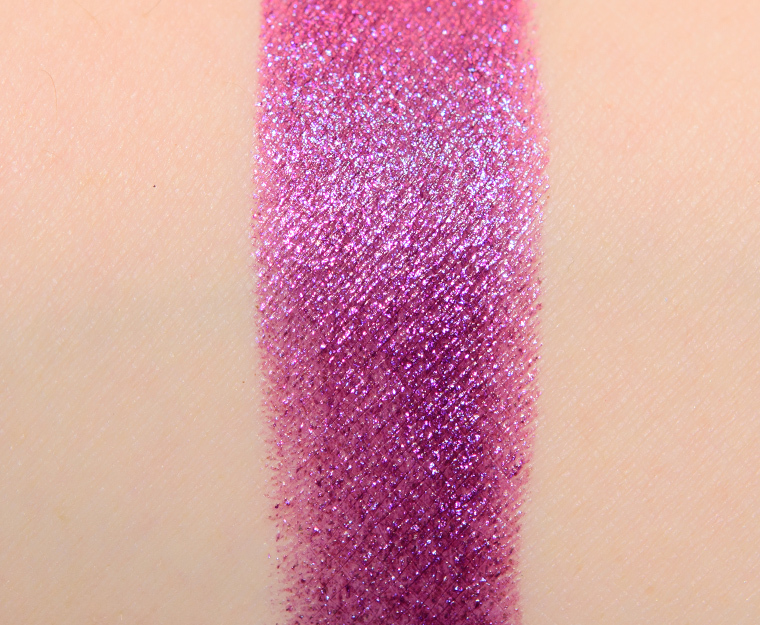 Obsessive Compulsive Cosmetics Alt-Girl (DC, $17.00) is lighter (80% similar). 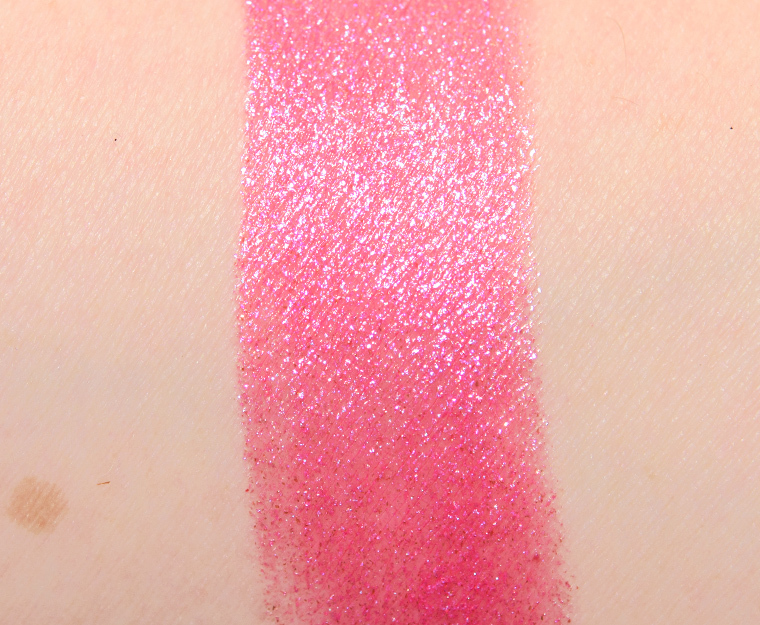 Milani Raving Matte (08) (LE, $8.99) is less shimmery, warmer, less glossy (80% similar). 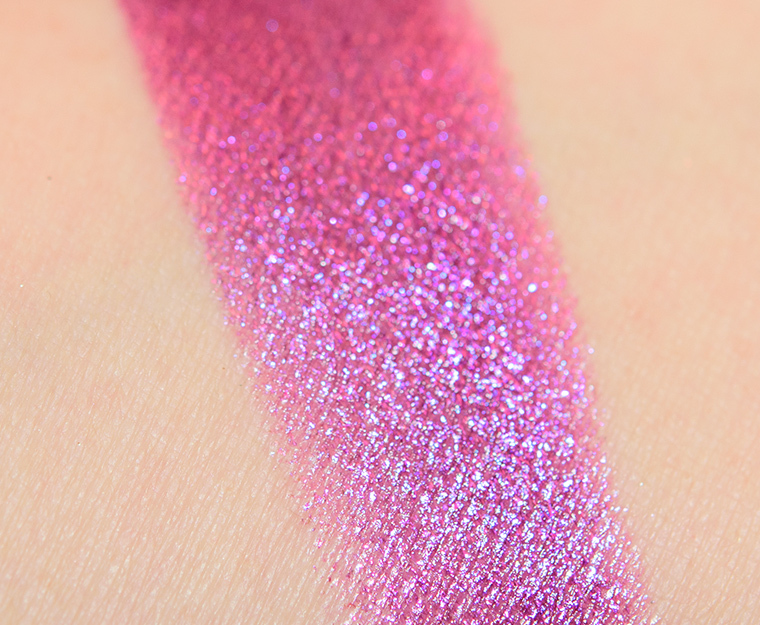 Urban Decay Mad Hatter (LE, $18.00) is lighter, warmer, less glossy (80% similar). Polybutene, Caprylic/Capric Triglyceride, Calcium Sodium Borosilicate, Polyethylene, Silica, Microcrystalline Wax/Cera Microcristallina, Dipentaerythrityl Hexahydroxystearate, Octyldodecanol, Dicalcium Phosphate, Disteardimonium Hectorite, Tin Oxide, Fragrance, Alcohol, Benzyl Alcohol, Pentaerythrityl Tetra-Di-T-Butyl Hydroxyhydrocinnamate, Water, Mica, Aluminum Calcium Sodium Silicate, Calcium Aluminum Borosilicate, Synthetic Fluorphlogopite, Titanium Dioxide (Ci 77891), Iron Oxides (Ci 77491), Red 7 Lake (Ci 15850), Blue 1 Lake (Ci 42090), Yellow 5 Lake (Ci 19140).